17 West Nile Street, Glasgow. There has been licensed premises on this site since 1845. Over the years there have been well known city wine & spirit Merchants trading from these premises including Alexander Gow, he had another pub on Dundas Street and lived out at Kintyre Villa, Helensburgh. 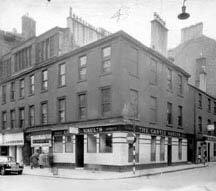 Another well known figure in the Scottish Licensed Trade was Robert Cansh, he owned some of the busiest bars in the city including 76 Glassford Street, now the Blane Valley, 69 Bells Street, 132 High Street, 1-3 Cathcart Road now the Brazen Head, 21 Adelphi Street, 102 Rutherglen Road and stores, headquarters and offices at 7 Garthland Street which is round the corner from the Blane Valley. Brothers George and John MacLachlan owned these premises, George was licence holder from 1884 until he died in 1909. The MacLachlan brother owned many pubs in the city and the Castle Brewery in Maryhill and the Auchentoshan Distillery, Duntocher. They sold Castle brand Pale Ales and Imperial Stouts and Iona, Five Castle and Auchentoshan whiskies. Their headquarters were the Castle Chambers in West Regent Street. 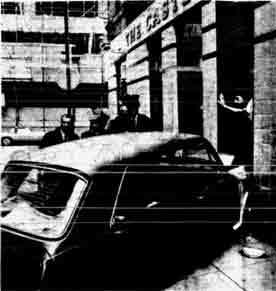 There pubs also had the name Castle Vaults above the door. In 1892 the MacLachlan brothers employed Duncan Forbes a talented brewer, Mr Forbes was born in the Black Isle, Rosshire. His first job after leaving school was a farm boy and at the age of 17 left his native town, he decided to become a brewer and worked for Messrs Arroll, brewers of Alloa as a maltman, after five years he left for Edinburgh and joined the staff of Messrs Younger & Sons as an assistant brewer. After two years with the firm the MacLachlan brothers made him an offer to take charge of their Castle Brewery, Maryhill. Duncan was very successful with the company and later became a Director of the firm, becoming licensee of many of the firms public houses. Mr Forbes was highly involved with the Glasgow Highlanders Association and presided at the annual dinner of the Ross and Cromarty Association. But this car has brought a new meaning to the phrase in Glasgow. It went missing yesterday and ended up in Drury Street trying to gatecrash this city pub the "Castle Bar." The door wasn't wide enough and it had to do without its "one for the road." A police spokesman said a man was helping police with their inquiries. 1976. 1845 E & C McLetchie. Also see Castle Vaults, Maryhill.